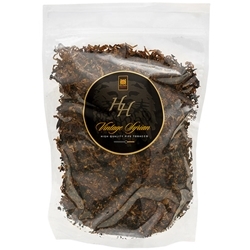 Mac Baren HH Vintage Syrian Pipe Tobacco, is a complex pipe tobacco blend where the base consists of smooth, yet potent Syrian Latakia tobaccos that make up almost half the volume. Included are Turkish Oriental to give a spicy note, with infused mixtures of Virginias from 3 continents added to give the blend a sweet natural flavor. To finish it off, a touch of dark fired Kentucky from the US is dropped in to produce an overall smoky taste without any bite.